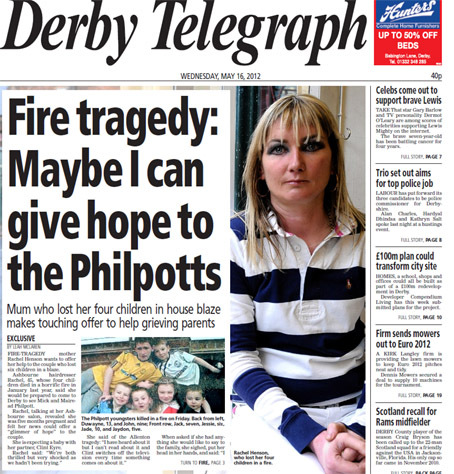 A Derby Telegraph photographer scored a front-page by-line with an exclusive follow-up on the fire that killed six children in the city. As police continued to probe the blaze that claimed the lives of all six children of Mick and Mairead Philpott, Leah McLaren secured an interview with Rachel Henson, who herself lost her four children in a house fire last year. In the interview Rachel revealed that she was five months pregnant, saying she hoped her news could offer a “glimmer of hope” to the Philpotts. The resulting story made the splash and meant a rare front-page by-line for a member of the photographic team. Editor Steve Hall said: “This was a very difficult story, involving approaching a mother who, only a few months ago, lost her four children in a fire to ask her thoughts on a blaze that had just robbed another family of their six children. “Leah had taken the original pictures of Rachel Henson and we believed that this previous association might make our approach easier. “The idea paid off handsomely, with Leah uncovering the line that Rachel is now expecting another child – and her belief that this news might offer some hope to the latest victims that there can be life after such a terrible tragedy. Added Steve: “The idea of photographers writing as well as taking images is something that we are actively pursuing. It’s in everyone’s interests for all staff to be as flexible and multi-talented as possible. Well done, Leah. There are many talented photographers out there who are bloody good journalists and know more than a thing or two. But I’m a bit worried about the suggestion that photographers need to be flexible and multi-talented. Not so long ago, reporters were given cameras and told to be flexible and multi-talented. Look at any football team and it has specialists. Forwards, midfielders, defenders and goalkeepers. Doing a bit of defensive work now and again is the norm for forwards, but they should concentrate on doing what they’re best at – scoring goals. The same with photographers and writers and designers. Jack of all trades, master of none. But none of the above should take away Leah’s achievement and a sensible decision by the editorial team. Only one question. Wasn’t the mum interviewed by a reporter when Leah took the earlier pictures? If so, where was that reporter? You can tell the design subs have left the building. Barring the masthead, this looks like a late inside page to me. I didn’t even know that snappers could write. The original reporter from the original story was on his annual leave when we had the idea…. Why are we celebrating more “multi-skilling” and creating more work for less people? Will we be happy when our bosses at Northcliffe think that they might as well get rid of some more staff as reporters can take photographs and vice versa? Think about this when the next round of “Aim-fire” strikes.